My friend, Jimmy, was just telling me that he keeps a big tub handy so that when he travels to Gatlinburg, Tennessee (he’s from Georgia), he can get a caramel corn refill for just $5.00. Oh, Jimmy. Did you not know that for $5.00, you could probably make three big buckets of the best caramel corn known to man? Yep. I wouldn’t lie to you. I’ve been making this caramel corn for so long that the recipe is written on a recipe card I was given at my wedding. I love looking at that old, stained card and remembering how rich I felt as a new bride when I realized I had a kitchen all to myself. I still feel that way sometimes. This is just amazingly good. This recipe is the reason why brown sugar was invented. It’s true. It used to be called “baked caramel corn sugar,” but somewhere along the line, someone got lazy and shortened it to “brown sugar.” Look it up if you don’t believe me. And what if I told you that this recipe is also the reason why butter was invented? 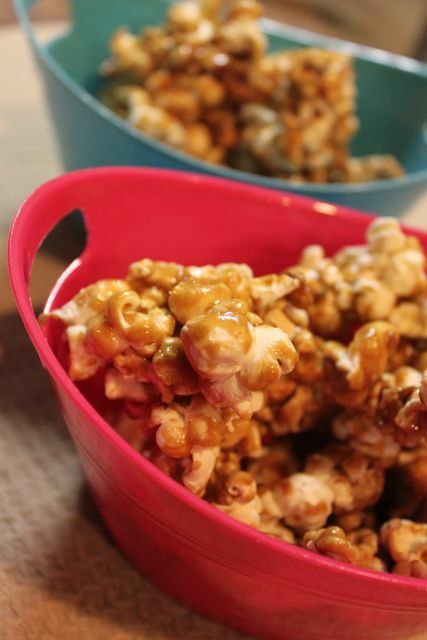 It used to be called “baked caramel corn fat/moistener” … what? You don’t believe me? Okay, doubter. Despite your cynicism, I will still share my cherished recipe with you. I am just THAT benevolent. 1 cube (or stick, if you’re from Georgia) of butter. They say unsalted, but … pshhh. This is so simple you’ll be wondering what’s wrong with you that you haven’t been making this every week of your life. First, preheat your oven to 250 degrees. Next, make a batch of air-popped popcorn. Did I tell you that this recipe is the reason air-popped popcorn poppers were invented? No? I meant to tell you that. Pour the popcorn in a greased (read: Pam-sprayed) bowl. A BIG bowl. In a pot, melt the butter, brown sugar, corn syrup and salt together. The moment everything is melted nicely and little bubbles begin to form around the edge, give it one good stir and then set a timer for five minutes. Do not stir during this time. I know … you want to stir. Don’t. Stir. When the five minutes are up, stir in the vanilla and then the baking soda. The mixture will bubble up a bit. 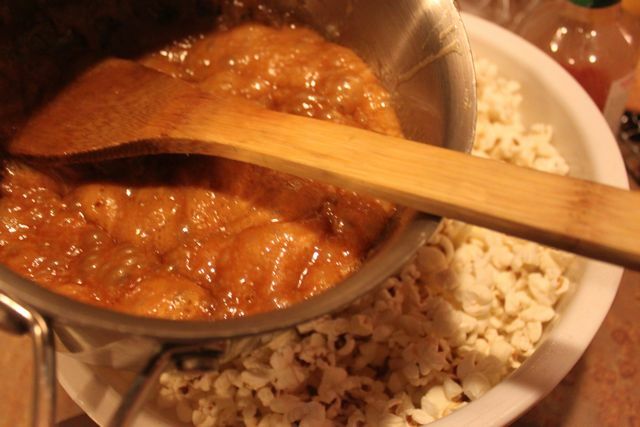 Pour over the popcorn and stir to try to cover as much as you can in caramel. You’ll get another chance each time you stir while it’s in the oven, so just do your best. Mix as well as you can, then spread out on a greased, rimmed baking sheet. Bake for one hour, pulling out every 20 minutes and stirring to coat. This is a great Christmas gift, just so you know. But it really shines during game six of the World Series. I can testify, first hand, that the caramel corn was a scrumptious success! Thank you Shannon and thank you Nicole 😉 And it’s now safely hidden so that it will last. 🙂 So I’m heading out to go get some ingredients to make my own batch! Yay! I’m glad you liked it! Of course, with that much butter and brown sugar, what’s not to like? 😀 Thanks for letting me know! oh my….this will be another staple for our family events…all you had to say was caramel and I’m there! Thanks Shannon…it just might make it out the door for gifts though…no promises..lol..